Each week, we focus on one game and share our thoughts on it, both from an on-field perspective and a fantasy football perspective. This week, we turn our attention to the Mile High city, where the Colts put together a solid 27-13 victory over the Broncos. Peyton Manning plays against the Broncos. Getty Images via espn.com. *The Broncos moved the ball up and down the field, at least through the air, but failed to get in the end zone in five red-zone trips. No matter how good Kyle Orton’s numbers look, he won’t be a quality quarterback until he finds consistency and success in that area. *Orton did make some big plays down field, notably to Brandon Lloyd, who had a monster 169-yard game. In Lloyd, Gaffney, and rookie Demaryius Thomas, the Broncos have an unsung group of receivers that’s playing well. The group’s chance to become special lies in Thomas, who is fast as lightning and tough. He made great hustle plays both as a blocker for Lloyd and as a tackler on a Jacob Lacey interception return. *Lacey and Kelvin Hayden (forced fumble) caused turnovers in the Colts secondary, but that group also allowed some big plays through blown contracts and missed tackles. That group could be a liability if the Colts struggle to generate pressure as they did in this game. *In case you haven’t noticed, Peyton Manning is good. He wasn’t his sharpest in this one yet still threw for 300-plus yards and three TDs. *Austin Collie really stepped up for the Colts when they needed him. Pierre Garcon and Anthony Gonzalez were out, and Champ Bailey did a good job on Reggie Wayne, but the Broncos (and especially Perrish Cox, who was filling in for Andre Goodman) had no answer for Collie, who went off for 171 yards and two touchdowns. Cox also fumbled a punt return that the Colts recovered and turned into a field goal, so it was not a good night for him. *Manning is good, but neither running game in this contest was. For the Colts, Joseph Addai and Donald Brown showed little burst or escapability. For Denver, Laurence Maroney was pedestrian in his Broncos debut (12 carries, 24 yards), while Correll Buckhalter is dependable but nothing more. Denver really missed the injured Knowshon Moreno. *Before the season, we believed that Austin Collie would be more valuable than Pierre Garcon to fantasy owners. Garcon didn’t play in this game, but Collie scored for the third straight week and finished with career highs in catches (12) and yards (171). Collie doesn’t get a ton of respect from fantasy owners, but even when Garcon plays Collie is a top-30 wideout who can be a No. 3 receiver in 10-team leagues. *Of all the backs on the rosters of these two teams, Moreno is the only one I could imagine starting with most confidence, and he’s injured. Maroney’s change of scenery doesn’t change his shortcomings, and Addai’s attractiveness for fantasy owners is based completely on situation, not ability. *Both Lloyd (169 yards) and Gaffney (12 catches, 140 yards) went over the century mark for the Broncos, but Lloyd’s inconsistency makes us leery of putting him in a lineup. With byes coming up Gaffney becomes a depth play, but Thomas is still the Bronco with the most fantasy upside. *Orton, meanwhile, is on a hot streak numbers-wise right now, to the point that he’s fighting to be a top-10 fantasy quarterback. You can start him with confidence. This is our final post in picking the best players at each position by jersey number. If you have quibbles, or want to add someone I forgot, leave a comment and we’ll update this post. Next, we’ll combine all of our posts to create our all-jersey number 2009 team. We started this project with wide receivers in this post and then with tight ends in this post and quarterbacks in this post and running backs in this post and offensive linemen in this post and kickers/punters in this post and defensive linemen in this post and linebackers in this post. Now we move to defensive backs, who wear numbers between 20 and 49. 45 – De’von Hall, Colts – Hall, an undrafted rookie out of Utah State, has seen action in four games in his rookie season, notching three tackles. He is the only active defensive back wearing 45. 47 – Jon McGraw, Chiefs – McGraw is in his eighth season, and he has started seven games for Kansas City this season, which is a career high. He also recorded his first career sack this season. His long career of contributing gives him the nod over rookie Cary Harris of Buffalo and fourth-year man Matt Giordano of Green Bay. 48 – Chris Horton, Redskins – Horton, a second-year player out of UCLA, emerged as a starter in his rookie season but fell out of the lineup before a midseason injury stopped his sophomore campaign. He is the only notable DB wearing 48. 49 – Rashad Johnson, Cardinals – Johnson, a third-round pick out of Arizona, is the only active defensive back wearing 49. He has not seen action this year. In honor of a vacation week spent partly in Baltimore, we share a few thoughts on the Week 11 game between the Colts and Ravens, both from an on-field perspective and a fantasy football perspective. Indianapolis stayed undefeated by scratching out a 17-15 victory in Baltimore. This was the sixth win by four points or less this season for the 10-0 Colts, and their fourth in a row by that kind of margin. Meanwhile, the 5-5 Ravens lost by less than a touchdown for the fourth time this season. *Two pregame thoughts. First, Sports Illustrated’s Ross Tucker had a nice historical tweet just before kickoff. He said: Scoreboard here in Baltimore says “Ravens 0 INDY 0”. They still don’t recognize the “Colts” after all these years. Funny. *Meanwhile, while I was in Baltimore this week, the hand-wringing was all about PK Matt Stover’s return to Baltimore as a Colt after so many years with the Ravens. The fact that Stover returned the same week the Ravens had to cut his replacement Steven Hauschka because of inconsistency only magnified how dependable Stover had been. No wonder the Ravens’ faithful went crazy when replacement Billy Cundiff narrowly made a 46-yard field goal in the first quarter. Cundiff hit 5-of-6 field goal attempts in the game, but the one he missed proved incredibly costly. *Dallas Clark’s touchdown catch early in the first quarter was an incredible display of concentration and hand strength. Catching the ball by palming it in your right hand with no other support on the ball, and tapping your toes in the end zone in the process, was something that not many other receivers could do. What a play. *Kelley Washington has been a nice find for the Ravens this year. He’s terrific on special teams, and he’s emerged as a solid No. 3 receiver as well. *Young Colts DBs Tim Jennings, Melvin Bullitt, and Jacob Lacey all made nice plays on the ball in the first quarter. That’s a good sign for a team trying to overcome injuries to Bob Sanders, Marlin Jackson, and Kelvin Hayden. *DE Haloti Ngata makes a huge difference for the Ravens’ defense. He busted up a fourth-down play at the end of the first quarter causing a penalty and a punt, and he makes that kind of impact regularly. He may well be the best player on that defense, and I’d argue that the Ravens need Ngata more than Terrell Suggs, who missed this game with an injury. *The Ravens’ offense is much more intimidating when Ray Rice is in the game than when Willis McGahee is. Rice provides the opportunity for special plays, and McGahee simply can’t. It’s not that McGahee is a bad back, because he’s OK. Rice, meanwhile, is a big-play threat as a runner and a receiver. LeRon McClain, meanwhile, looks slow and tentative – nothing like the power back he was last year. *The Colts have really restocked their playmaking ability with rookies Austin Collie and Donald Brown, along with first-year player Pierre Garcon and second-year tight end Tom Santi, who stepped up in this game. That shot of youth is vital with Marvin Harrison gone and Joseph Addai getting more banged up by the day. *The Ravens did a good job of making plays on the ball vs. Peyton Manning after the first drive, and safeties Ed Reed and Dawan Landry both got interceptions. Reed and Landry make for a strong pair up the middle in the secondary. *Joe Flacco isn’t the machine that Peyton Manning is, but he showed on the two-minute drill at the end of the first half that he’s a big-time quarterback. Flacco is allowing the Ravens to develop offensively as a new kind of team, and the downfield throw out of his own end zone in the third quarter was a beauty. But you could see the difference in Flacco’s inconsistency on third down, which forced the Ravens to settle for four first-half field goals. And the pick Flacco threw in the fourth quarter was more egregious than either of the interceptions Manning threw in this game. *The Colts’ front 7 isn’t big, and the only way they could generate a ton of pressure was to send a huge blitz against Flacco. That’s something that some team is going to exploit before the end of the season. Dwight Freeney and Robert Mathis weren’t able to generate a ton of pressure on their own against young and huge Ravens OTs Michael Oher and Jared Gaither. For the Colts, Gary Brackett not only had a pick – he had the most impact on that front seven throughout the game. He’s such a solid player for Indy. *Ravens head coach John Harbaugh did a great job of managing his replay challenges until late in the fourth quarter. He went 2-for-2 on challenges – both of which were ultra-close and therefore worth challenging regarding the outcome – and more importantly avoided a challenge that would have failed in the second quarter. That decision to pick up the red flag saved the Ravens a timeout and probably three points in the first half and 22 yards on a successful challenge in the second half. But when Harbaugh called timeout and then challenged a spot late in the fourth quarter, he cost his team its final timeout and about 40 seconds toward a last-gasp comeback. *Reggie Wayne is one of the top five receivers in the league. He’s so good catching the ball that you’re surprised when he doesn’t come up with it. His dominance allows youngsters like Garcon and Collie to make plays in spaces much bigger than usual. *Dallas Clark isn’t just the best fantasy tight end available; he’s one of the top 15 receivers of any kind in the league. No other tight end comes close to matching his production, because no tight end is as vital a part of his offense as Clark is for Indy. *Pierre Garcon, who had a 100-yard game, has gone back ahead of Austin Collie as the Colts’ No. 2 wide receiver, mainly because he’s more prone to bust a big play. Garcon is much like Mike Wallace of Pittsburgh in that he’s going to get 2-3 shots at a huge play each week, and if he makes one of those plays, he can help your fantasy team. Garcon isn’t as valuable as some teams’ No. 2 wideouts because of the Dallas Clark factor, but he is a top-35 receiver who can spot start as long as Anthony Gonzalez’s injury continues to linger. 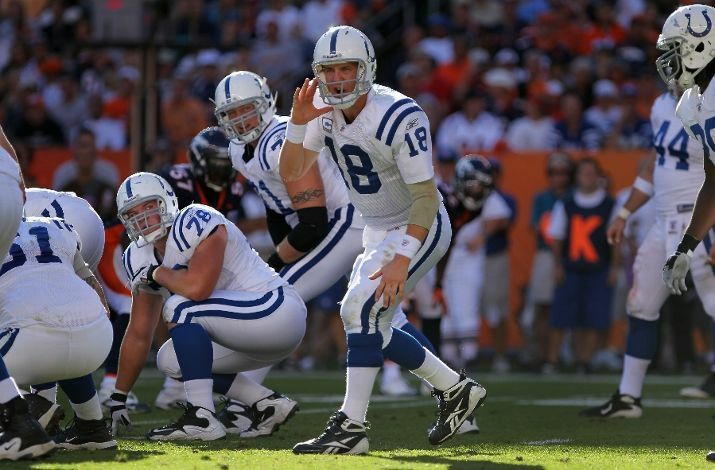 *Colts TE Tom Santi hadn’t had a catch all season, but he had six in this game for the Colts, including a 31-yarder. Santi must have been playing a bigger role in this game because of a matchup the Colts saw that made a two-TE set advantageous. But fantasy owners shouldn’t rely too much on Santi going forward. The Colts don’t use two-TE sets regularly enough to make Santi ownable in any league, despite his 80-yard effort in this game. The fact that Santi fumbled once in the end zone and dropped another possible touchdown won’t add to the young tight end’s chances going forward. *Joseph Addai scored a rushing touchdown in this game, and he has at least 60 yards per scrimmage in every game but one this season. So while he feels like an unreliable fantasy back, his numbers have been good enough to put him inside the top 20 at the position. He’s a fantasy starter, but he’s not a dominant force. *Ray Rice is just a yardage machine. He’s so good as a runner and receiver that he’s going to pile up 120-150 yards in just about any game. And if he breaks a big play or scores a touchdown, he puts up elite fantasy numbers. He’s become a dependable top-10 fantasy back. *Derrick Mason is old for a wide receiver, but he continues to produce solid fantasy numbers as the Ravens’ unquestioned No. 1 wideout. He had more than 100 yards in this game, passing the century mark for just the second time this season. But he has had at least 78 yards in five of 10 games, which makes him a solid top-25 wideout. He’s not cemented as a starter, but he’s a nice option to have around.